We have established the Ecopositive Life Cycle Benefit Assessment (LCBA) Platform . It offers exciting new initiatives including LCBA methods, datasets and project starter kits for business and industry and LCADesignStudio for students, interns and practitioners. LCBA extends the reach of negative LCA of loss and impacts that stops at zero (nothing lost or gained). It reaches to asses positive benefits like oxygen generation and rain harvesting, soil biota creation, species richness and ecosystem enrichment. It enables practitioners to go beyond LCA that ends at no net gain to objectively measure ecopositive design and development. To learn more and contribute to LCBA concepts or research initiatives read the Elephant Foot Garbage Chute E-Diverter and two of our posters from SETAC in Brussels in May 2017. As well as reducing loads on its finite carrying capacity a sustainable world needs it inhabitants to apply operations that benefit, and grow natural capital and repair its finite carrying capacity. There are many tools for measuring unsustainable development including Life Cycle Assessment (LCA), the International Standards Organisation Environmental Management System method designed to reduce industrial pollution and resource depletion which are negative burdens rather than positive benefits. LCA has no methodology for analysis or assessment of systems’ ecopositive outcomes for example that may include capacity for oxygen generation, fresh and ground water absorption, ecosystem and species richness and habitat recovery. Instead it can consider oxygen depletion, water consumption, ecosystem depletion and habitat loss. Counting that moves away from loss to gain is outside the current scope of LCA because it lacks the reach to assess moves into and across positive domains. The aim is to generate discourse and creation of new quantitative methods for ecopositive development. While the focus here is on LCA, the author argues the same principals are applicable to a range of approaches currently used to assess or reduce negative outcomes of unsustainable development. Theoretical and practical transitions are the key to transforming the scope of negative perspectives into viewpoints society needs to stand in to be able to sight and then discern positive outcomes. Sustainability practitioners need new applications and capability to assess benefits, power to create traction in, discretion to ensure gains, capacity to increase reach of and drive to impel development towards eco-positive outcomes. To reinforce opinion and qualitative argument such outcomes must be objectively assessed, distinctly clear, physically attainable and quantitatively investment worthy. Because it is designed to model, analyse and assess negative impacts of systems as well as improvement and proximity to zero burden goals and benchmarks along the way LCA can only assess the lack of rather than the growth of real sustainability. 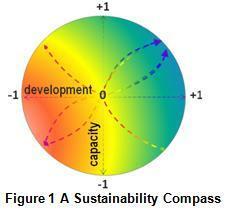 For example Figure 1, a sustainability direction guide or compass depicts negative impact on the sphere, across red to orange zones with a yellow fringe. Red-tip arrow lines arising near -1 development (impact) and -1 capacity (loss) lead to near zero impact. Existing Life Cycle Impact Assessment (LCIA) is shown to start with impacts and capacity loss and stop at zero impact. Since all positive outcomes are outside LCIA range it has no scope to go beyond zero in approaching positive sustainability. An LCA concept is needed to model, analyse and assess positive benefits as well as improvement and proximity to regenerative and full-benefit goals and real benchmarks along the way. This is essential for defining sustainability theory, research, models and practice. For example positive benefit is depicted on the sphere in Figure 1 across green to blue zones with some yellow fringe. Blue-tip development lines are from zero to points between +1 development (benefit) and +1 capacity (gain). 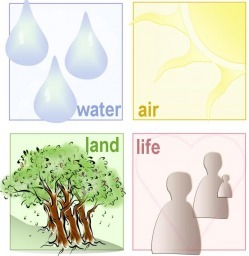 Community Health considers populations’ needs to restore and improve health after environmentally induced illness, disability and morbidity such as listed as benefit layers in Table 1, in units of Health Adjusted Life Years (HALY). Ecosystem Replenishment considers ecosystem species, population size or geographical distribution as listed in Table 1 below, in units of positive ecosystem replenishment fraction per square metre (PERF*m2/yr) per year for ecosystem, habitat, biodiversity plus built and urban ecocapacity. Energy and Resource Viability considers increased renewable and cycling material supply essential to a community as in Table 3, in units of surplus energy and resource viability (SERV*MJ/capita GFA).